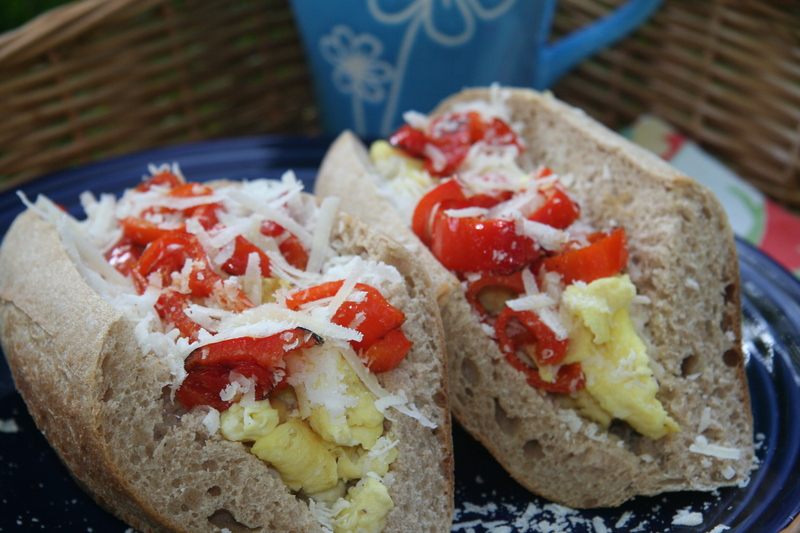 I grew up around a lot of Italians but never ate an egg and pepper sandwich until about five years ago when my birthmother, who is half Italian and who has a history of marrying Italians, made them for dinner one night when she was visiting me at The Dusty Dog. Wait, what’s a birthmother? She’s the woman who gave me up for adoption when I was born. I found her 18 years ago, which is another story all together…stay tuned for the memoir. She didn’t have to twist my arm — I’d been doing all the cooking since she’d arrived, and not having grown up with her, I wanted to know more about the things she cooked. In my fantasies of her, she makes lasagna, pizza, spaghetti and pretty much anything involving tomato sauce on a daily basis, but the reality is, her style is more basic American standard – things like pot roast, meatloaf, casseroles. To my knowledge, the most exotic thing she makes is fried smelts for Christmas Eve. I’ve never eaten her fried smelts, but learning to make them is on my cooking to do list. I’m no longer in contact with her, (more memoir material) so I’m on the lookout for a traditional Italian recipe. If any of you have one, let me know – maybe I’ll visit your kitchen and feature your fried smelts on gnocchi no. 9. Now, back to the egg and pepper sandwich and onto what makes it Jersey style. My birthmother used to be married to two different Italian men from New Jersey – ok they were brothers, but I wasn’t going to say anything because well…you know, they were brothers. 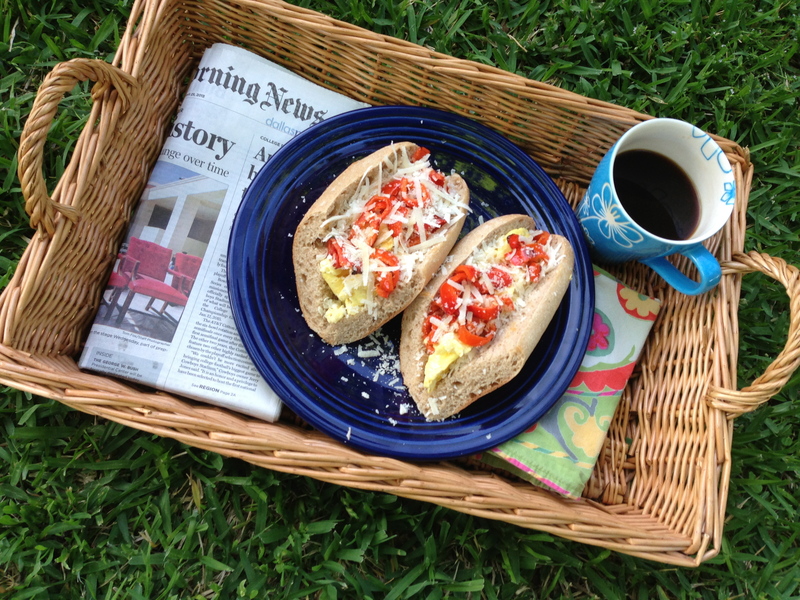 According to my birthmother, Brother Jersey number one and Brother Jersey number two loved egg and pepper sandwiches any time of day – breakfast, lunch, or dinner. 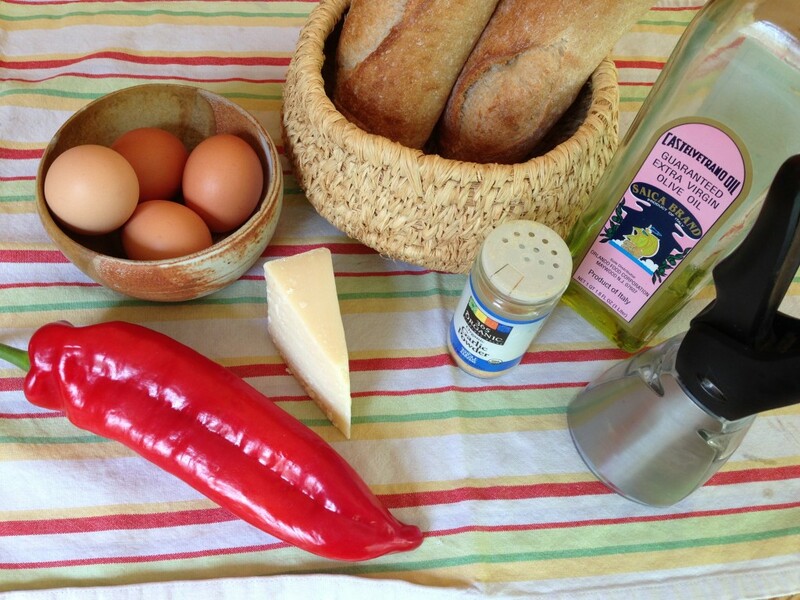 I wondered if the egg and pepper sandwich was an Italian thing or a Jersey thing. When I looked it up, I found The Proud Italian Cook who is not from Jersey but Chicago and who is clearly Italian. She makes a variation of this savory concoction, but the Jersey version adds parmesan instead of Romano cheese. In my research on the egg and pepper sandwich, I also discovered that in Chicago, this is a popular sandwich on Friday’s during lent. It’s origins seem to be with early Italian immigrants, and from the looks of it, you can get egg and pepper sandwiches on Fridays during lent all over Chicago from delis to street vendor carts to Italian restaurants. My birthmother made our sandwiches with a couple of mild Hatch chiles but said she would normally use regular bell peppers. 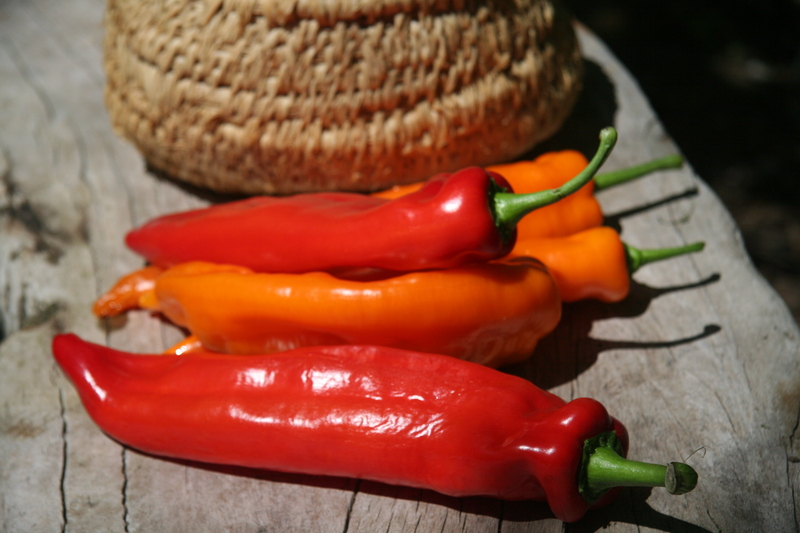 When I make them, I like to buy the sweetest peppers I can find. At this time of year, Whole Foods has some beautiful long, red, and orange peppers called Sweet Twisters . They are the perfect sweet peppers if you ask me, and I’ve been putting them in everything. Any type of pepper you prefer or have on hand will do the trick, and I know you have a good piece of parmesan after that caramelized onion, pasta, and parmesan post from last week. Now, it’s time to scramble some eggs and top them with a good quality pepper, and some delicious parmesan – it’s the perfect mix of sweet, yet pungent flavors. 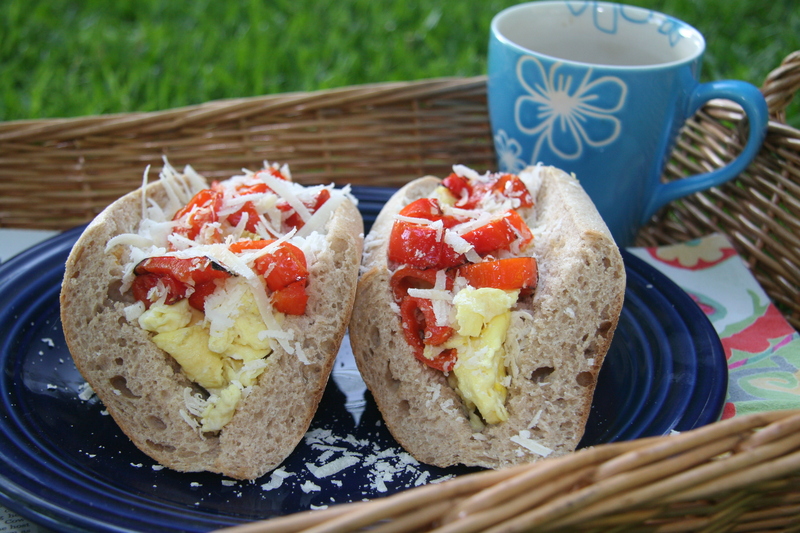 And, whether your Italian or not, this is a quick and easy any time of day sandwich. Buon Appetito. 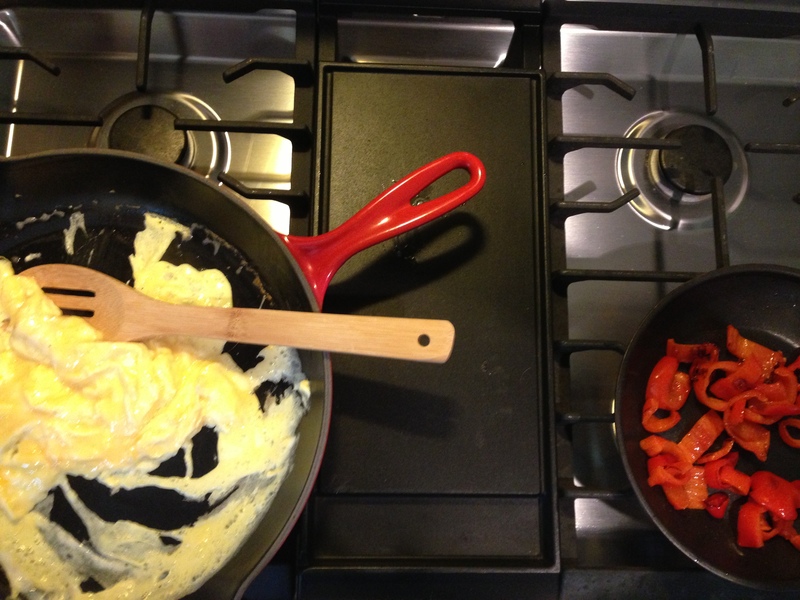 Melt the butter in a nonstick skillet over medium heat and add the whisked eggs. Scramble until done to your liking. Heat olive oil over medium heat and add the pepper slices and garlic powder. Saute until soft and starting to brown. Slice the bread down the middle and fill with eggs. Top with a generous helping of peppers and grated parmesan. 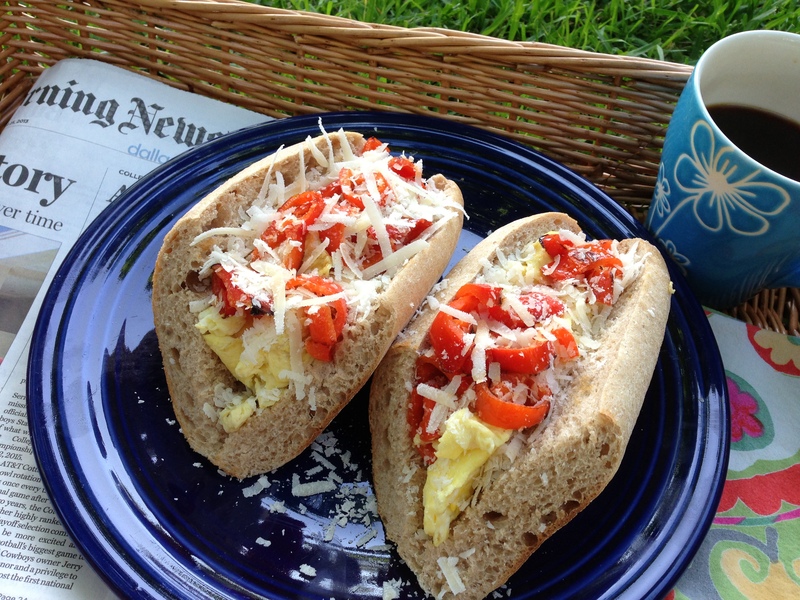 This entry was posted in Breakfast, Eggs, Main Dishes, Quick & Easy, Recipes, Sandwiches & Wraps, Uncategorized and tagged Comfort Food, Easy & Quick, Eggs, Italian, Lent, Parmesan, Peppers, Sandwiches. Bookmark the permalink. What a fun egg dish. Thanks for this recipe and exactly how to make it. The way the sandwich should look helped me, too. I am looking forward to surprising Howard for a great breakfast on a Sunday. I think a surprise Sunday breakfast sounds wonderful! Let me know how it turns out.